Analysis of films & television shows, particularly those that are complex & run deep. but then shall I know even as also I am known. 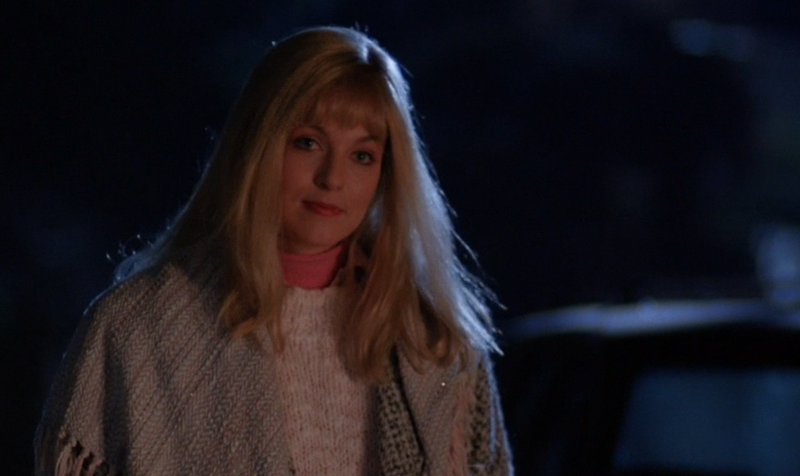 Margaret Lanterman opens this episode, which centers on the burial of Laura Palmer, with some thoughts on sadness. There is a sadness in this world, for we are ignorant of many things. Yes, we are ignorant of many beautiful things - things like the truth. So sadness, in our ignorance, is very real. To me, she echoes Buddhist ideas on suffering: she emphasizes how intense and pervasive this sadness is, how real it is in our lives, but also that it arises out our ignorance of the truth, and possibly of other "beautiful things." The idea is reminiscent of Agent Jefferies insistence that "we live inside a dream", that somehow our experiences are far more generated from within ourselves than they are perceived from the world outside. The idea seems like a revelation to him, and he issues it as a warning. 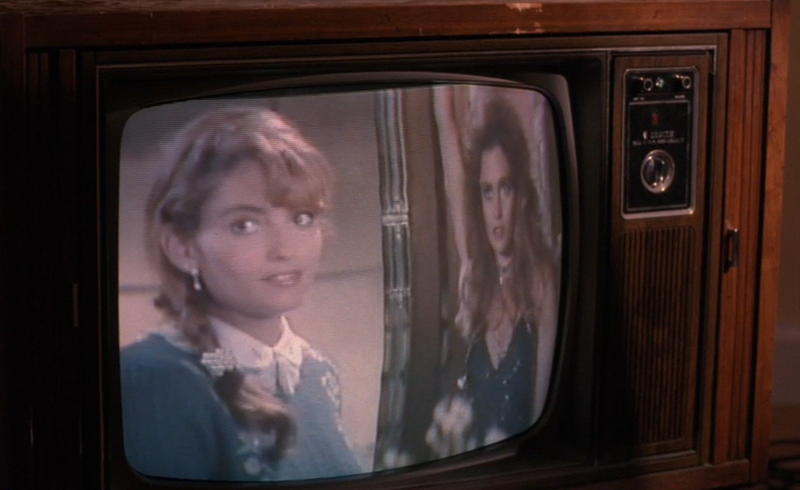 The feeling of being inside a dream pervades Twin Peaks, in both the positive and negative senses of that, and the character sometimes seem aware of it. 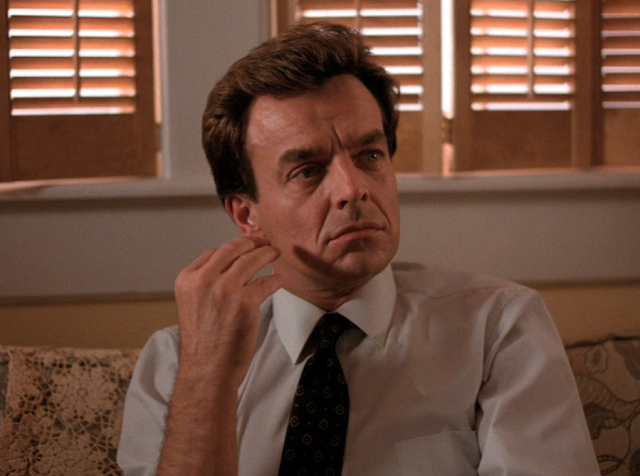 In the standoff at Dead Dog Farms, Jean Renault says that Twin Peaks lived in a quiet dream before Laura's death and Cooper's arrival, which brought on the "nightmare": maybe a part of the process of waking up. till he sees all things thro' narrow chinks of his cavern. 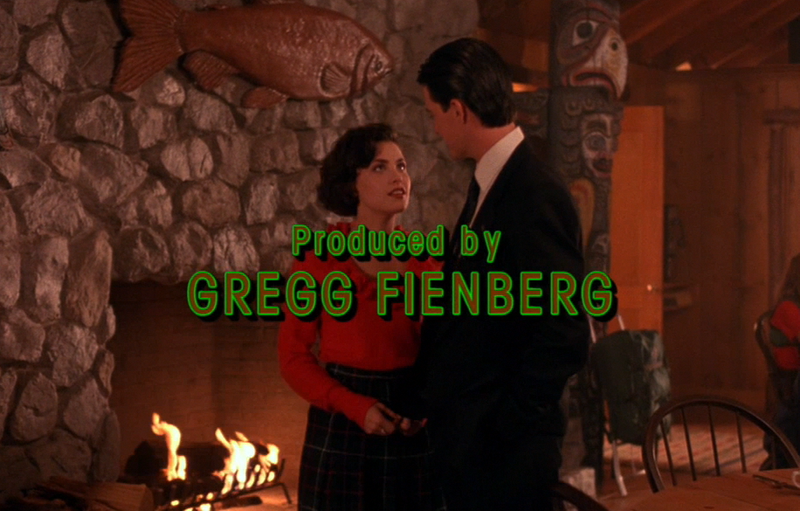 The episode begins with slow fade from the waterfalls in front of the Great Northern Hotel, and we sort of peer through the waters to a stunning image of Audrey in a bright blouse, waiting for Agent Cooper to arrive in the dining room. As is the pattern for introducing members of the Horne family, Audrey is standing before a fire. The early morning meeting (7:15 a.m.) recalls the opening scene of the first episode, which is the last interaction that Audrey and Cooper have had. Her blouse there was equally interesting, a forest pattern of trees, while here it's a fiery red. Maybe a bit of foreshadowing; around the Horne family and within the Great Northern itself, the elemental forces of water, wood, and fire always seem to have a subtle guiding presence. Audrey is asked to leave when Sheriff Truman and Lucy arrive to discuss Cooper's dream. Truman is eager to have the killer revealed, but Cooper instead begins with the dreams details. Right away, we notice discrepancies between how we saw the dream unfold in the last episode with how Cooper is describing it now. He begins saying, Wizard of Oz-style, that Truman and Lucy were both "there" - when would this have been, and in what capacity were they present? Cooper says that, in his dream, Sarah Palmer has a vision of her daughter's killer. This corresponds somewhat, as the dream as we saw it starts out with disjointed images of Sarah on the staircase, BOB crouched at the foot of the bed, a bloody rag in the train-car, and Laura's body in the morgue. - in the dream that we saw, MIKE opens with the full FWWM verse, Cooper relates that FWWM was the text of the tattoo that both MIKE and BOB have/had on their arms (Cooper gestures to his left arm) - Mike didn't say that in the dream we saw, only that he'd been "touched by the devilish one... tattoo on the left shoulder"
Do you know where dreams come from? 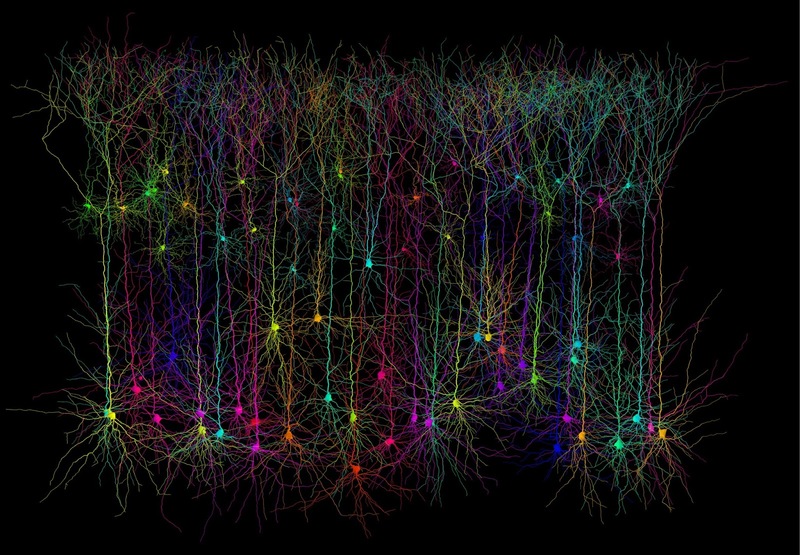 Acetylcholine neurons fire high-voltage impulses into the fore-brain. These impulses become pictures, the pictures become dreams, but no one know why we choose these particular pictures. I enjoy how Truman seems a little perplexed by the inclusion of this detail, while Lucy is quite interested, and makes a careful note on Cooper's explanation of the origin of dreams. 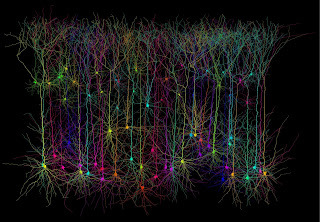 I'm not well-read in the physiology of dreams, but from what I have taken in from documentaries and popular science books, Cooper's explanation is pretty accurate: some sort of electrical storm lies at the base of dreaming, and other parts of brain have to make sense of the stream of images making their way into the sleeping consciousness. Some have argued that electrical impulses are random, and that the cortex weaves stories & meanings out of these meaningless inputs. 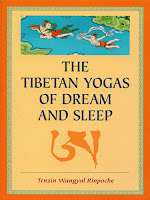 At a few points in my life, I've paid closer attention to my own dreams, keeping a dream journal, attempting practices of lucid dreaming/dream yoga, and analyzing the results with various concepts from Freud and Jung. From those exercises, it seemed clear that part of the mind is definitely working out its concerns and worries, using these strange elements that arise from deeper in the brain. Tensions that arose in the waking hours, particularly if they were sharply suppressed or unacknowledged in the moment, will be the themes lying hidden behind a lot what goes on in one's dreams. I wouldn't be surprised if these high-voltage electrical impulses were in fact random. My own sense is (unfounded by any science) that the brain might need an element of the chaotic and the unformed in its processes to stay organized and to create meaning. Hard for me to quite figure out what it is, but maybe it's like how most games begin: first you shake the Scrabble tiles, then you find the words, first you scramble the dominoes, then you arrange them by the numbers of spots they display. I wonder if this process has some role in the age-old occupation of divination, where some element of chance, like tea leaves at the bottom of a cup or a shuffled deck of Tarot cards provides the random elements needed for intuition to make some sense of the flow of our daily lives, much like waking dreams. Cooper's idea of impulses becoming pictures, and pictures becoming dreams, rings true for me. The more I watched carefully, in real time, it definitely seemed to me that they weren't actually like movies (though I remembered them like that). 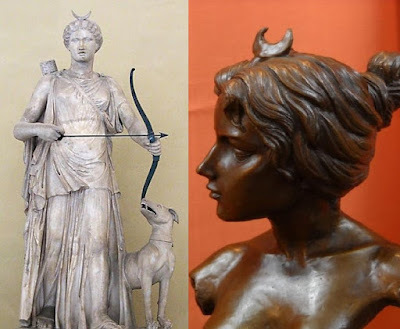 They were more like distinct images, or maybe even visual ideas, that would then give rise to sort of a verbal storytelling (which would then be played out with moving images like a movie.) In real time, I have seen myself changing things and altering timelines as I went (the basis for a lot of "he was Ryan, but also kind of Peter at the same time" type-moments) - but those "pictures" were kind of the bedrock below the changeable narratives & imagery running above. Cooper seems unconcerned with the loss of the killer's identity, and enthused by the prospect of unpacking the import of the strange dream. The process of the investigation is as important as result, and Cooper's displays a respect for the events to proceed with their own momentum, raising the idea of timing and cycles of time that will continue. The griddle cakes and ham (and the maple syrup!) appears on the table instantaneously, as the conversation is interrupted by a radio dispatch from Andy from the morgue at the hospital. Following that, in the morgue scene, when Sheriff Truman has had enough and sends Albert flying, there's something strange in the way he lands. I never noticed it until it was pointed out to me in a discussion forum,* but the punch sends Albert spinning backwards, knocking him over onto Laura's body on the autopsy table. There is no clear shot of it, but from the series of images, it seems like Albert ended up at a perpendicular angle to Laura's body, his feet still on the floor. Yet, in the next shot, as the camera is further away, Albert is now completely off the floor, totally on the table and on top of Laura's body, lying more or less face-to-face with Laura. It's subtle, and impossible to say if it's intentional, but the second image in this series of four is a much more physically realistic landing than the third image. 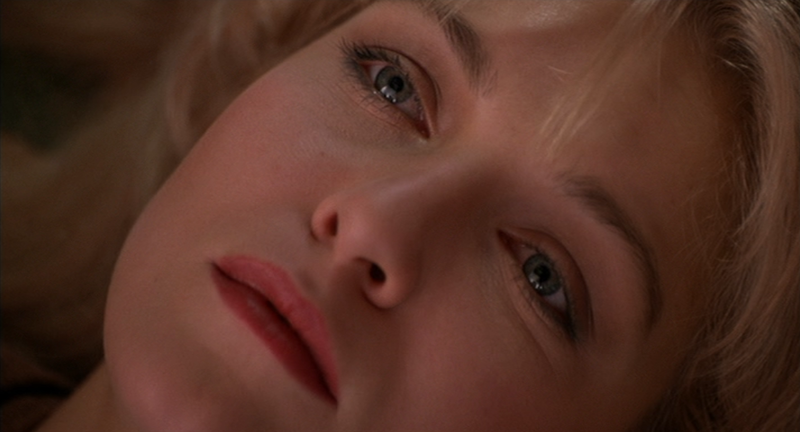 It leaves one with an unsettled feeling: the dim lighting, the group of men and the air of violence surround the lifeless, undressed body of Laura Palmer, and finally the image of lying Albert on top of her, maybe suggests an element of sexual excitement hidden in the background of the male mind's interest in cases such as these. I've come across some feminist critiques of Twin Peaks**, and though I haven't read through them carefully, they seem to criticize the series for encouraging this same sort of prurient interest in sexual violence in the minds of the audience. Moments such as this scene (assuming this was intentional) show me that the series is aware of this dynamic within the interest in the mystery of "Who Killed Laura Palmer?" While they don't do it with a heavy hand, moment like when Audrey confronts Ben about having slept with Laura, or just the general feeling in the town that everyone was responsible for Laura's death, hints at the commonness of sexual violence. 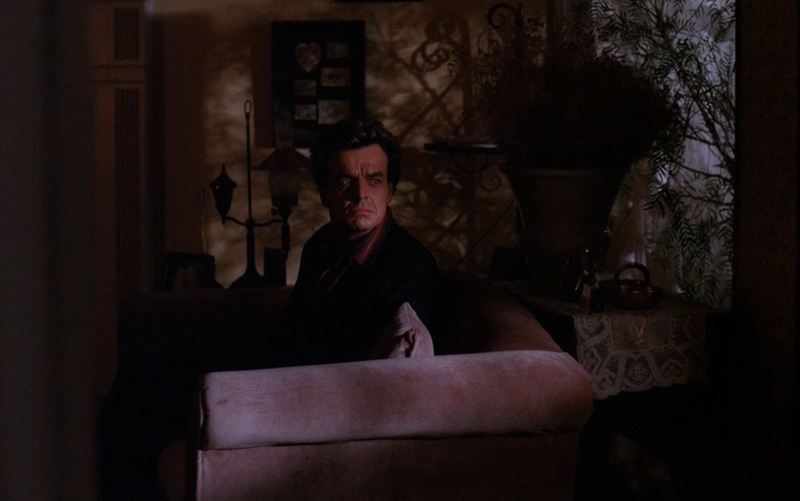 FWWM is, in my view, among other things, an exploration of the dark realities of sexual violence, in all its social & spiritual ramifications, but Lynch is such a strange storyteller, I'm not sure how many people picked up on that, and/or would agree with me. The same person who alerted me to this continuity error also pointed out one I'd missed in the Pilot. * Between visiting the incoherent Ronette before heading to the morgue for the first time, Cooper and Truman are chased down by Dr. Jacoby. His vibe is definitely creepy in the scene, and I was aware of him reaching under the skirt on hula-girl tie as he talked about Laura, sort of an unconscious tell. What I didn't notice was that the scene alternates between two shots, one from over the left shoulder of Jacoby, the other Cooper's and Truman's POV. In both shots, Jacoby takes an earplug out of his right ear as Cooper is introduced, and holds it in his right hand. But the two takes diverge: in the shot from Cooper and Truman's side, Jacoby switches the earplug to his left hand, and then puts his fingers underneath the skirt. But in the over-the-shoulder shot, the earplug never leaves his right hand, and he never touches the tie. What exactly this could be signifying is unclear: could it be a way of depicting Cooper's initial suspicions of Jacoby's involvement in the murder? Or maybe the in-continuity is a way of suggesting Cooper is projecting his own subconscious uneasiness regarding the dark sexuality of this case onto Jacoby, away from himself. Interesting that the continuity error again has subtly disturbing sexual connotations, and is connected the Laura in the morgue. Continuity errors, like Freudian slips, are impossible to say for sure if they imply anything, but then again its hard to deny that subconscious impulses sometimes find their way through these cracks. * nikkiweir from the IMDB forums, whose notes must contain one of the most careful & idiosyncratic viewings of Twin Peaks that I've ever come across! In the following scene, we see Leland at home, midday, and a nurse has administered some sort of medication intravenously into Leland's arm (what was she giving him? 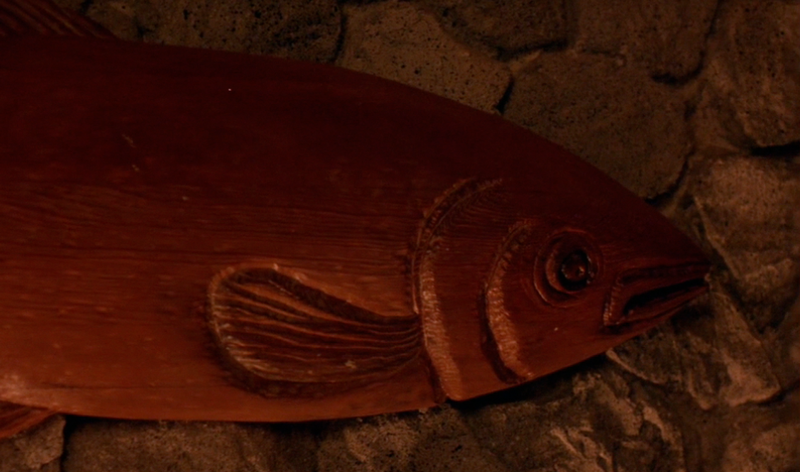 maybe a bit of foreshadowing of the importance of haloperidol in Twin Peaks). 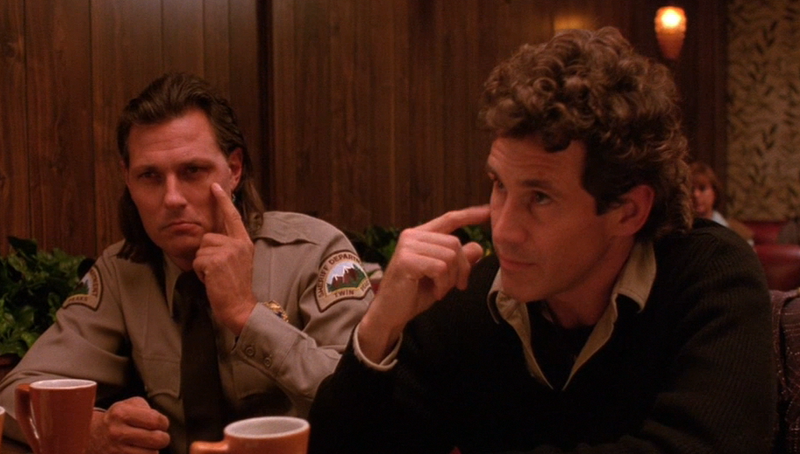 Something strikes me as odd about about Leland's hand in this scene. Maybe it's due to Leland holding still the cotton the nurse has pressed, possibly it's the angle the shot was taken from, but his arm seems slightly too large for his body, and the hand seems strangely immobile as Leland pulls his head back in surprise at Maddy Ferguson's arrival. 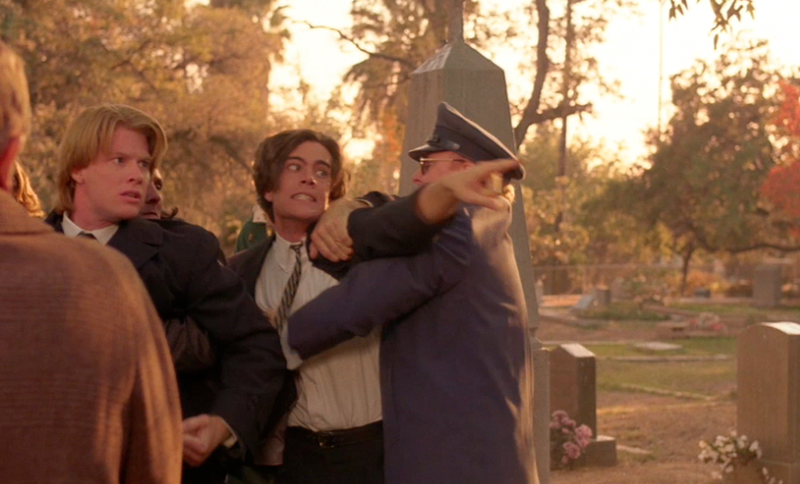 Re-watching the scene, it almost looks to me like it is someone else's arm rising up to Leland's face. A small point, but possibly the beginning of a theme, as the nervous control of arms and the right/left-handed dichotomy becomes important later in the series and within FWWM. The afternoon soap, Invitation to Love, is playing, and of course it is mirroring the plot of the the show itself. The patriarch of the soap. Jared Lancaster, is writing a letter to his daughters (twins? ), informing them of the suicide he is planning to attempt that night. The look on Leland's face makes it clear that the idea resonates with him. As Madeline Ferguson is trying to catch Leland's attention, in Invitation, Jade is pounding on the door, calling to her father: "Daddy, please, I know you're in there!" The scene works on a lot of levels. Selena Swift playing both Emerald and Jade is a quick parody of having Sheryl Lee take on a second role in the series. Below that humour, the theme of "doubles" - of Madeline being a double of Laura, of Emerald and Jade being the same actress, of Invitation doubling Twin Peaks all foreshadow the idea of doppelgängers, which won't resurface in the series until the very end of the second season. Emerald and Jade seems to be split along the good girl/bad girl, madonna/whore duality, the same fault line that ran through split life of Laura Palmer, Meals-on-Wheels volunteer and coke addict. In Twin Peaks, that idea of a split personality runs, I think, deeper than someone having a secret life, or someone having contradictory social roles within a community. The idea of a fractured psyche, where different aspects of a personality have dis-integrated, a volitional ignorance has been established between the fragments, and communication falls away between the fractious aspects of the mind: to me this a key exploration of Twin Peaks, in the psychology of both Leland and Laura Palmer, an undercurrent to the series and a focus of FWWM. Like Gordon Cole, the name Madeleine Ferguson the name hearkens back to a classic Hollywood film, seeming to be a mash-up from Hitchcock's Vertigo, of Kim Novak's character, Madeleine Elster, and that of Jimmy Stewart, Scottie Ferguson. 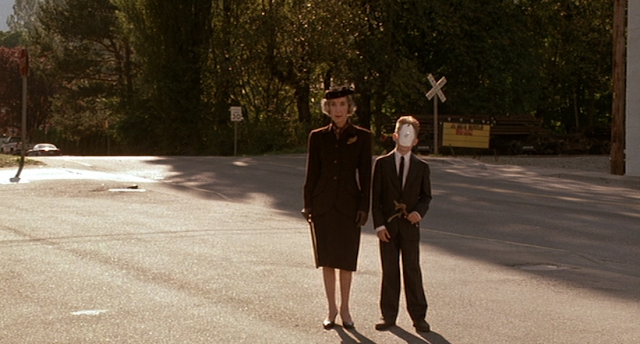 Hard to say what this could signify: Madeleine Elster in Vertigo is sort of a beautiful phantom, similar to what the memory of Laura Palmer has become in Twin Peaks. The desperation of Scottie Ferguson to find Madeleine Elster within her doppelgänger, Judy Barton, may not be far off what Leland sees in Maddy. Another point of interest: naming the daughter characters in Invitation after colours or precious stones, emerald and jade. At this point, perhaps it could be another Wizard of Oz reference, to the promised land of the Emerald City? Exterior of the Brigg's residence. 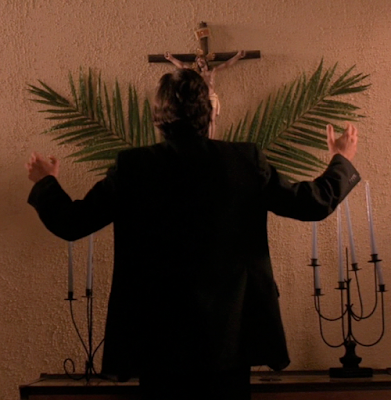 Another scene in the Brigg's house, before the family leaves for the funeral, opens with Bobby outstretching his arms before a crucifix. 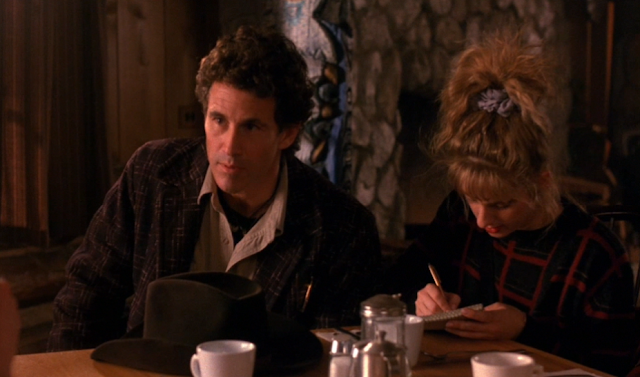 The scene gains depth after having read The Diary of Laura Palmer and coming back into the early part of the series after FWWM, with Bobby shooting and killing the Deputy Sheriff of Dear Meadow. 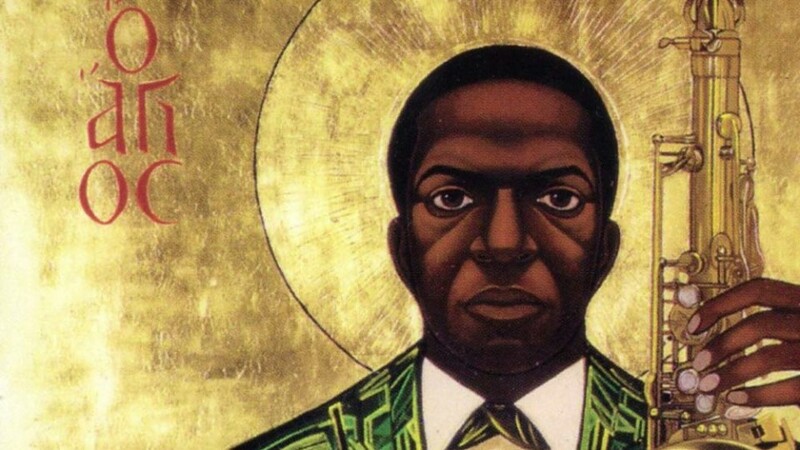 An image relating to suffering and being redeemed would resonate. 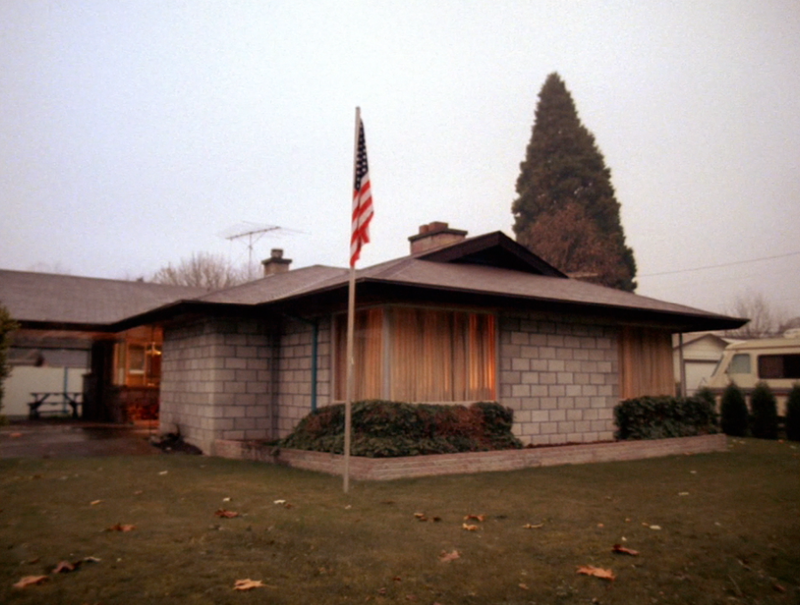 I think part of the deeper backstory of Twin Peaks is Laura, falling further into the influence of BOB and/or the trauma of abuse, having begun to move that darkness into the lives of people around her, first to Bobby, increasingly to Donna, and from there perhaps to worse corruptions. Bobby plays with his lighter, a little entranced. The image recalls Leland's memories of Robertson, flicking matches at him, years ago at Pearl Lakes: "You want to play with fire, little boy?" Early in the episode, a connection had been drawn between Bobby and his friend Mike, to the spirits BOB and MIKE. 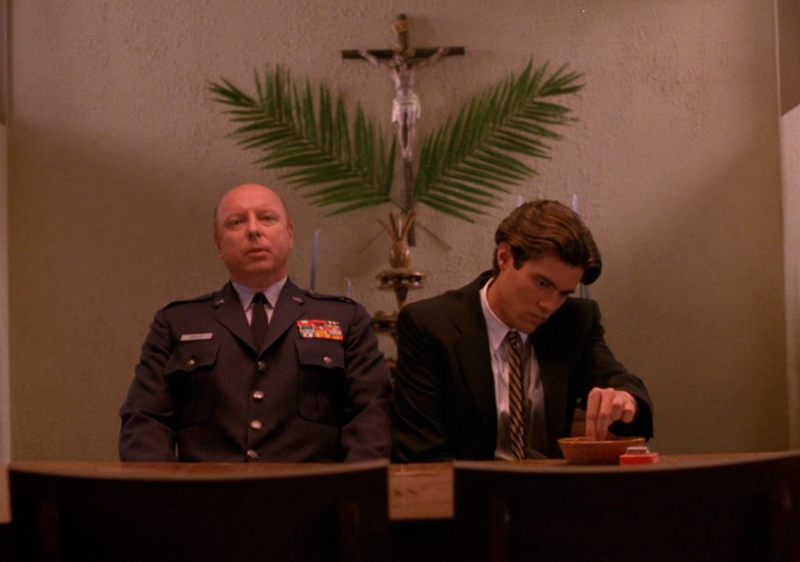 The funeral scene ends with Bobby and Mike lunging towards James, with Bobby's voice subjected to the same strange slow-motion distortion jail cell barking in the pilot. To me it suggests animalistic rage & a sense of possession, like Sarah Palmer's voice at the diner in the finale, or the strange sounds BOB makes while assaulting Maddie in Lonely Souls. 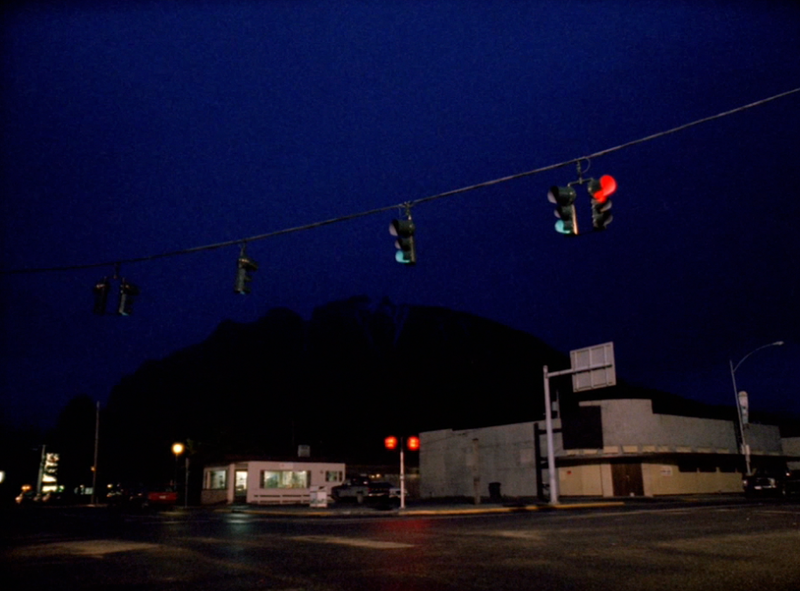 Something in these early scenes suggests a darkness having grown in Bobby, and begins to suggestion of time repeating in cycles, as patterns passing through through the generations and through history, and of time looping back in on itself, a theme that the moebius-like structures of Lynch's later films seem to continue. Major Garland enters the room, aligned again, as he was in Traces to Nowhere, with the golden plate hanging on the wall. It reminds me, as mentioned before, of the alchemical concept of gold being the ideal of purified metal, the goal of a progression of lead to tin, to copper and silver, through which metals can rise. Mark frost mentions the idea of Garland being the "most enlightened man" living in Twin Peaks (Cooper, being an outsider, would be not be a part of that ranking) mentioned in his Twin Peaks Podcast interview. "In ceremony begins understanding." 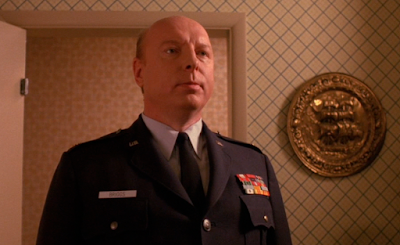 Originally, Garland Briggs seemed to me a ridiculous, authoritarian blowhard, playing a role in a pretty obvious trope of teenaged-rebellion the Bobby storyline seemed to be. Throughout Twin Peaks, and Lynch's works in general, bald & brain-dead absurdities are the surface of the depths, and now I see strange wisdom in all of Garland's remarks. Somehow, the straight-laced military man has gained some insight into the irrational. 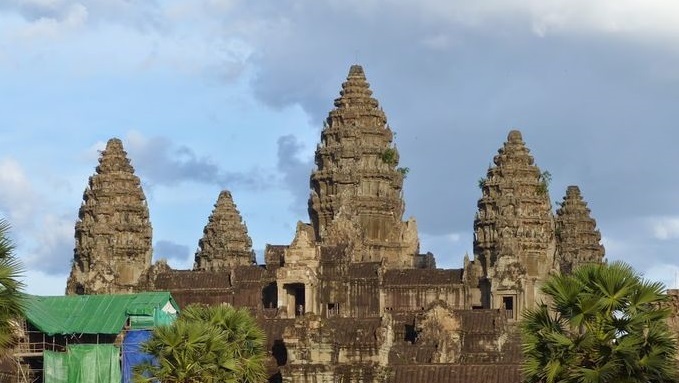 His U.S. Air Force Project Blue Book investigations into the paranormal seem to have given him an anthropologist's interest in human culture & society, like a Jesuit in a foreign land. His remark that "in ceremonies begin understanding" evinces an awareness that the unconscious depths of the mind require ritual + ceremony to undergird the rational mind's processing of an event. The primal brain-stem needs a map before the logical neocortex can make sense. In relation to Laura's funeral, the statement forebodes that a reckoning of the full implications of Laura's death is about to commence. Below the palm leaves, what is pineapple on top of the three-tiered fountain? I swear I remember seeing a pineapple just like that in an alchemical/rosicrucian woodcut, but try as I might, I couldn't find the image. Searching pineapple imagery online, one resonant idea was that pineapples & pinecones, due to their similar structure, are used throughout history to represent the pineal gland, seat of the "third eye", offering vision beyond regular perception. A inner doorway into other worlds. Ancient moments like the the Angkor Wat temples of Cambodia could be examples of the motif. 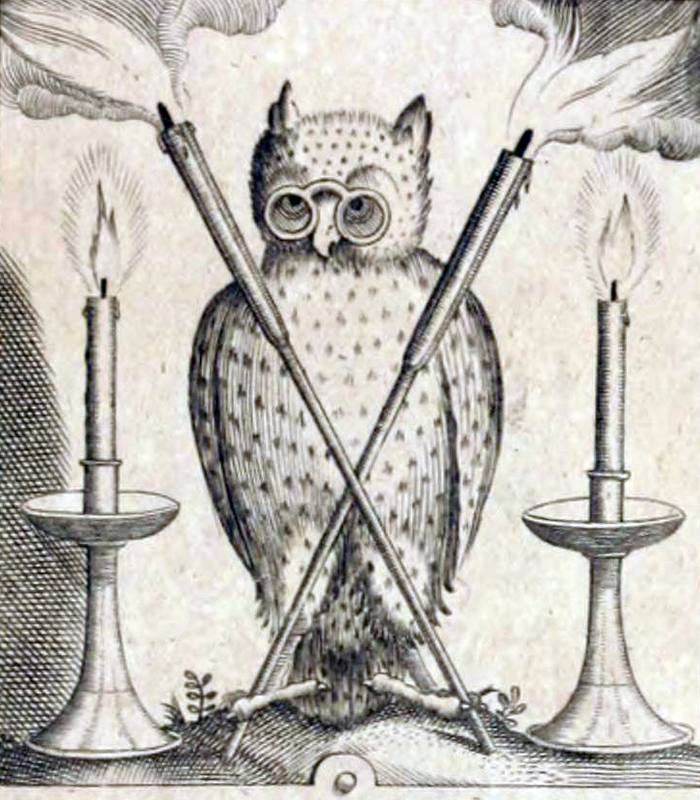 This woodcut of an owl gives some idea of the style I remember the pineapple emblem engraving. Would be very appreciative of any reader who might be able to track that down. A lovely shot of a string of traffic lights, swinging in the night. The funeral scene transitions immediately to an odd moment, of Shelly mocking Leland's grief for the amusement of two elderly men. Seems a little out of character. 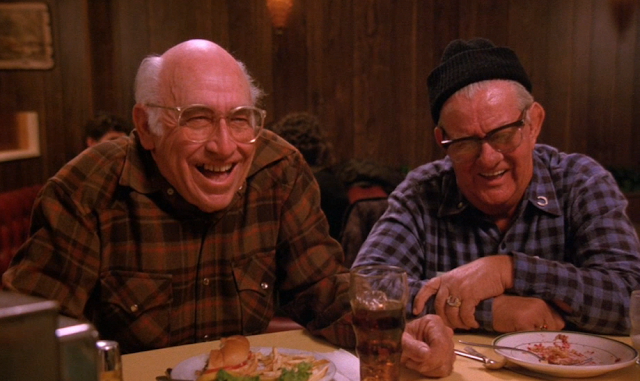 Their laughter & all this malicious grinning reminds me of another menacing elderly couple. 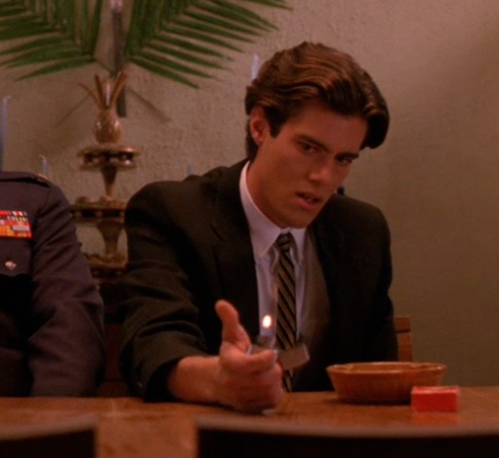 Just behind them in the corner of the diner, Truman, Ed and Hawk are preparing to reveal their secret society to Agent Cooper. Ed's bolo tie - what is the ornament depicting? It resembles an eclipse, like in the opening shot of 2001. More lunar imagery. 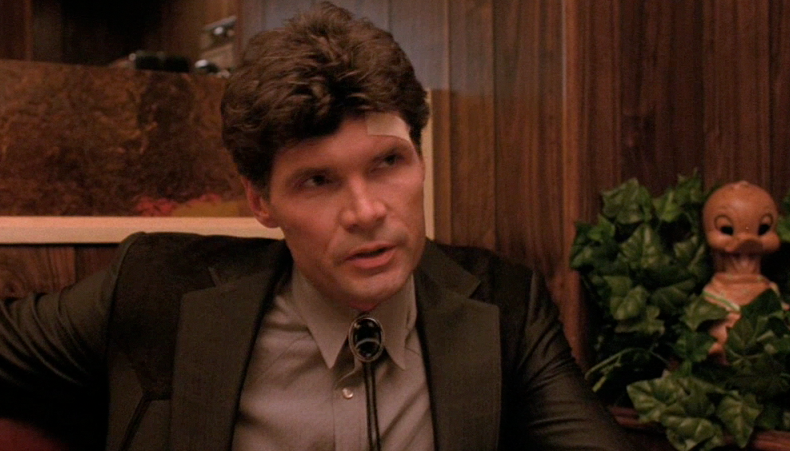 Must return to Sheriff Truman's golden spiral/shell necklace when it shows up in an episode more clearly. Truman gently leads Cooper towards some understandings about the town of Twin Peaks. Behind the 1950s/Eisenhower American ideal, the white picket fences of Blue Velvet, there is a "back-end to that... a sort of evil out there... a darkness, a presence," a counter-balancing weight. Truman refers to this presence lurking in "these old woods... as long as anyone can remember..." Could the sawmill of Twin Peaks, maybe like that of Lumberton in Blue Velvet, have loosed a destructive natural force on the inhabitants of the town? 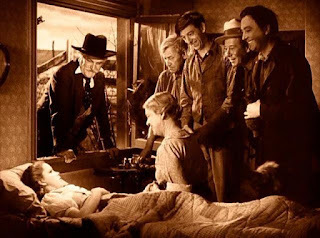 The way that the pilot episode moves back and forth from Laura's murder to scenes at the sawmill and of Horne trying to sell Ghostwood Forest for development suggests an underlying connection. The way that the series ends, with Horne's environmental awakening and the speeches at the pageant, makes me wonder if there isn't some comment here about the ramifications of ecological destruction for economic ends. From an interesting book dealing with the age old phenomena of demons and exorcisms, interesting to see how the descriptions line up with the dark forces in the narrative of Twin Peaks. 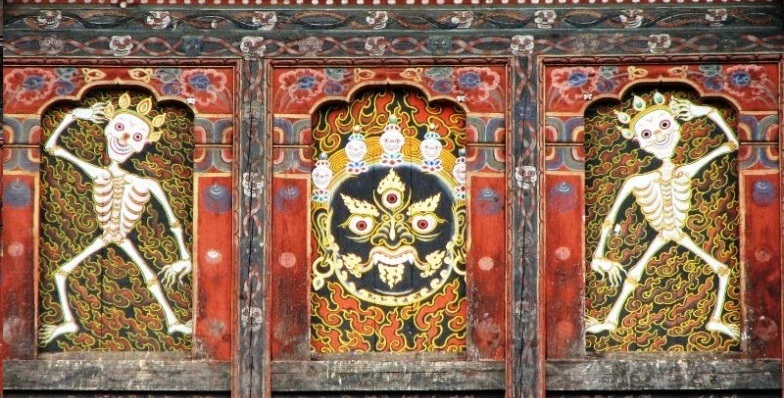 ...what I think the natural demonic being is: to assist in the end of something that is corrupt [...] For us in today's world I would say that the demonic beings in our world have been pulled, coaxed, and invited out of their world by a variety of human acts and that activity is accelerating. It might also be that there is a natural order in place and we are in a time of decay which is facilitating more beings to 'leak' through into our world. Their secret hand sign, a tear drawn below the left eye: A memorial of some sad event? They give the symbol right after the bookhouse is mentioned, seems to imply a connection. The meeting place is (presumably) a used book store, where the coffee is free. Seems like a decent place to develop the wisdom & judgement needed for such a society. Truman says that they've been meeting here for "going on twenty years now..." This episode occurring in 1989, the bookhouse has then hosted this society since the very late 1960s. The society itself goes back much further: "we've always been out here to fight it... Men before us [glances at Hawk], men before them, more after we're gone..." An allusion again to generations and cycles of time, intimating that the dynamic they're engaged in somehow has its roots in the land & the natural world, existing far before the area was colonized, echoes from the deep past. Interesting too that this "darkness in the woods" is brought up in connection not to Laura's murder, but rather to drug-running from Canada and the Renault brothers. 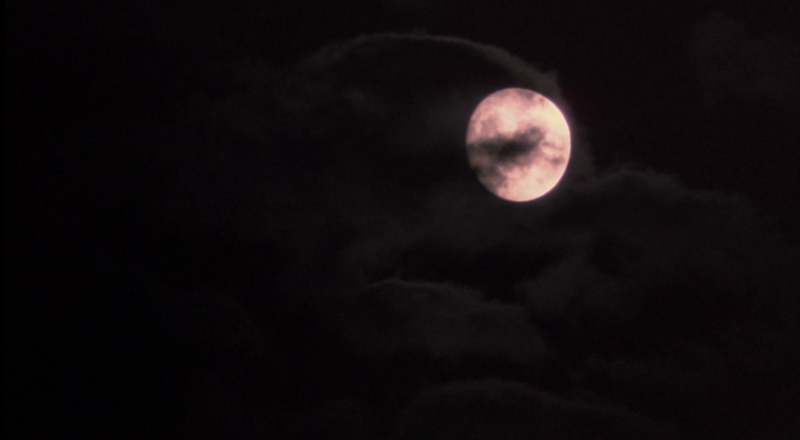 "Falling" plays as the episode moves from a rendezvous scene between Hank & Josie and the final scene of the episode, and accompanies the first time the moon is used as a transitional shot. So far, there have been transitional shots of natural elements, such as the surfaces of a lake, wind blowing in the pines, mountain ranges, etc., but this marks the beginning of a series of transitions that use an image of the moon to connect scenes. Some moon-related themes have been raised in previous installments of this blog, possible connections between the name Diane/Sylvia/Cynthia and the moon and forest goddess Diana/Artemis, and the timing of the moon cycles, the moon dial in the Hayward's grandfather clock. I think there may be more to this thread, relating to the timing of the killings and the candles circling the mound of dirt. The image of the moon transitions to a scene of Agent Cooper and Deputy Hawk unwinding over a couple of beers, four days after Laura's death. Cooper asks Hawk about the existence of the soul. - Do you believe in the soul? - Blackfoot legend. Waking souls that give life to the mind and the body, a dream soul that wanders. - Dream souls. Where do they wander? - Far away places. The land of the dead. Their conversation, with Falling still playing in the background, is laid over an image Leland, entranced in some sort of reverie on the dance floor at the Great Northern. His own soul seems to be off in a distant place. Kind of a strange shot: the camera seems like it's handheld, holding on Leland's face while loosely floating through the bobbing heads of the dancers, moving to music that neither we nor, likely, Leland is able to hear. Cooper and Hawk clink their bottles in cheers, and the soundscape switches to a diagetic track of Big Band jazz. Leland grins and begins to dance. 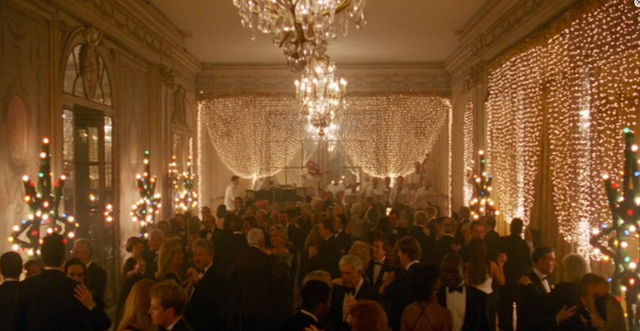 This closing scene, in its otherworldly feel, with jazz music and dancing, seems to echo the previous episode's ending, the Red Room sequence. Interesting how Twin Peaks uses jazz to provide connotations of other-worldliness. 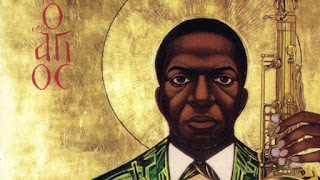 To me, jazz has associations of being a gritty, urban, cerebral, grounded form of music, entwined with history and popular culture (though, as I write that, musicians come to mind to break all of those assumptions). 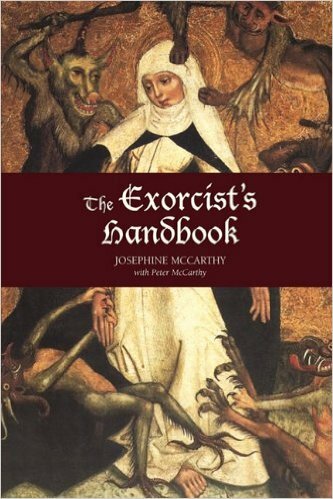 I might think something like a Gregorian chant or Tibetan throat singing would be the way to score a scene brimming with mystery from the beyond. (Actually, the album of medieval music, Lux Vivens, that Lynch would later produce would be about the sound I might expect.) Yet somehow Lynch and Badalamenti have managed to weave several layers of jazz into the metaphysical backdrop of Twin Peaks, while the ethereal vocals of Julee Cruise become entwined with the lumber mill and the local dive bar. Early on, the character of Audrey seems connected with jazz music. Sometimes it accentuates her role as a bombshell, at other time she seems transported to another place in its dreamlike nature. A separate style of jazz seems to belong to the Red Room, from the MFAP dancing to Jimmy Scott's performance in the finale. Leland is paired with an older, Big Band style, maybe calling back to the type of music that was popular at the time of his childhood summers at Pearl Lakes. He always seems to fall out of sync with the music, as he did spinning in the living room with Laura's photograph, on dance floor here, and also with the Icelanders and his performance at the Hayward Supper Club. 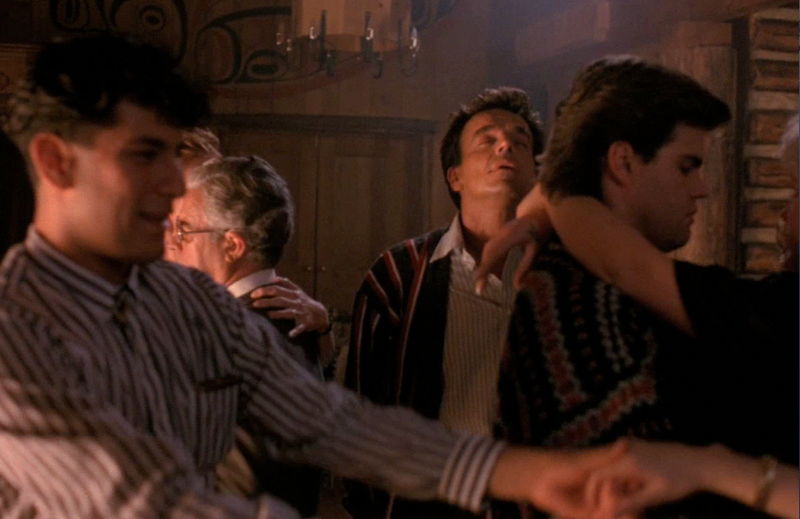 It's interesting that Hawk's dialogue - about a dream soul that wanders separate from the waking soul, about the Land of the Dead - is played over the image of Leland on the dance floor. The juxtaposition reminded me of the Jitterbug scene at the opening of Mulholland Dr., also accompanied by Big Band jazz. Some have found allusions here to the idea of an afterlife "bardo" experience, that MD represents not so much a dream but rather the post-suicide experiences of Diane Selwyn. Interesting too the the jitterbug sequence emerges out of the black screen of the opening credits; you can hear the sound of the wind blowing, and something that sounds to me like the deep notes of Tibetan chanting or the horns that often accompany them. 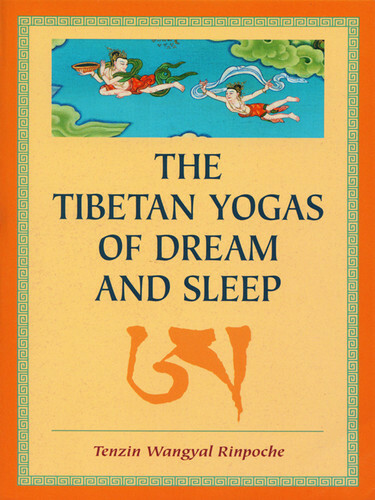 Dreams are classified by the Tibetans as a form of bardo, and both I think involve the psyche dealing with imagery generated to represent realities beyond what we encounter in our waking experience. Both also involve the unfurling of karmic energies, the released momentum created by the actions we have taken and the experiences we have had in the previous day, in the previous life. Themes alluding to the Tibetan Bardol Thodol, the flashes of nebulous, dream-like imagery arising in the transitional states, the clear light of consciousness, accounts of spirits moving between two worlds, all seem very relevant to the narrative of Twin Peaks. The episode ends with Hawk asserting that all he's sure of is that Laura's body is in the ground. 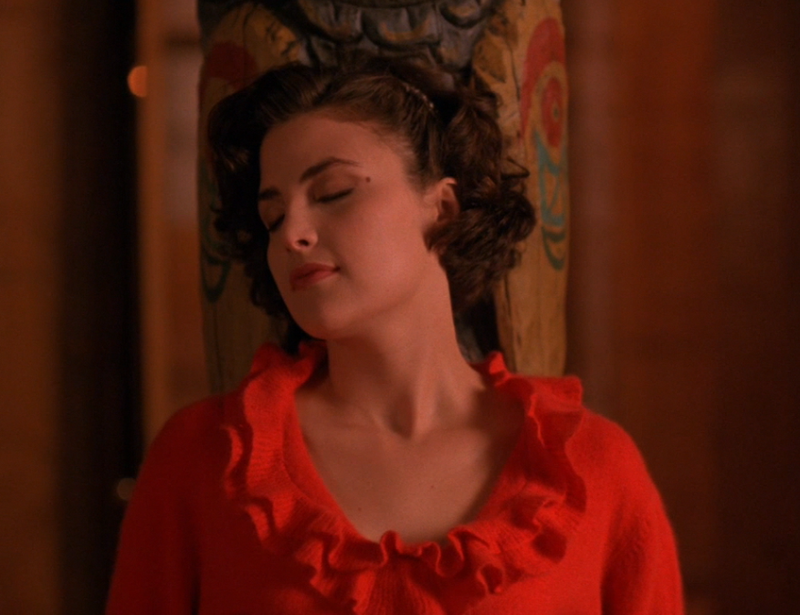 I can't help but feel that this final sequence intimates that Laura's spirit has not passed yet out from Twin Peaks, and that somehow a resolution to the bizarre energies of Leland on dance-floor must occur in order for her to move on to the next world. The Log Lady's introduction seems to allude to this: the suffering is entirely real, its roots lying in illusion and misperception, it must be dealt with and encountered, until we can see again clearly. I enjoyed your essay here, but I think you went down a wrong path at first in your interpretation of the so-called "dream sequences." You're offering a materialist description of dreams that says they're merely manufactured by brain chemicals. Neither Lynch nor Mark Frost(co-author) are materialists. Lynch has been into Transcendent Meditation and Hinduism for over 35 years. Mark Frost has acknowledged his interest and study of Western esotericists Alice Bailey, Madame Blavatsky and persons around the "Order of the Golden Dawn, plus metaphysical writer Colin Wilson and others in this vein. Thankfully, though, you eventually expressed it correctly, that the "dream sequences" in Twin Peaks are actually portraying other dimensions, as real as this one. Cooper's consciousness enters these other realms in his sleep and returns. "Bob" is not some figment conjured up by electro-chemical processes in the brain, but a real "evil spirit" on the loose. 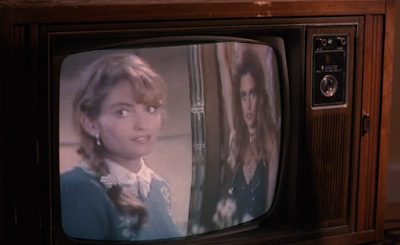 Along these lines, you might be interested in Jay Dyer's essay on Twin Peaks. Simple theme. Theme images by Brasil2. Powered by Blogger.